After some months of work of a lot of people (thank you all: Csaba, Jim, Alain, Fredo, André, Diego, Jon, Jimmy and Andy) we have finally ended the EA2 summits catalog update. Today (yesterday night) the new references were active at SOTAwatch, and we could not imagine a better way to celebrate it than make one of the new. These days we've been "suffering" an unsual snowy weather, with temperatures around and below 0ºC. Being at so few kilometers from the coastline, in this zone the climate tends to be warmer. Last week, however, we had some beaches covered by snow. All this said, Marcial EA2BDS and me chose one of the summits amongst the lowest and nearest to the shore ones. Unbe Mendi, EA2/BI-076. The roads here were pretty iced on some places, and small country roads were frecuently covered. But as an ancient basque proverb says "gogoa dagoenean, aldaparik ez" (when you really want something, there are no slopes big enough). And we reach the site. The temp was about 0-2ºC and the sky was partially covered, but not sign of rain coming. It was a good chance of wearing my new SOTA cap. 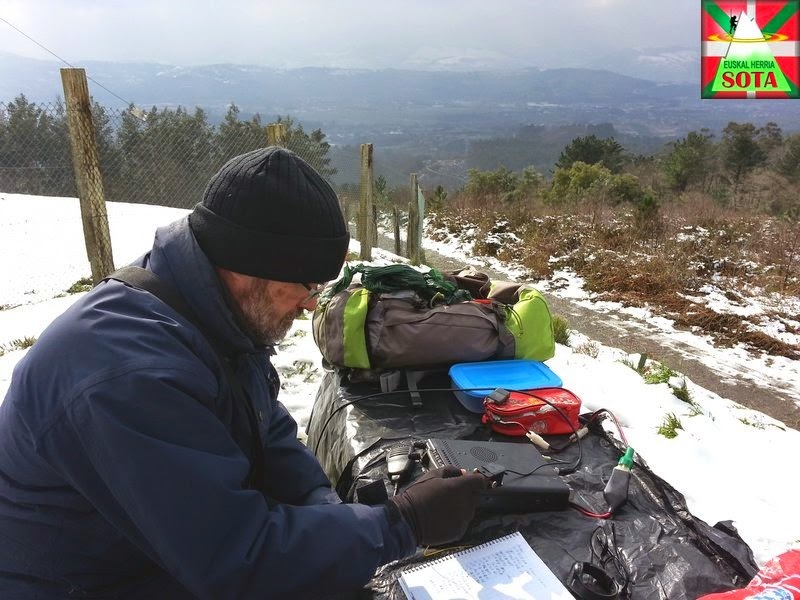 We started first on 2m FM for the locals, first summit official QSO with Andoni EB1CU who after some time as chaser has recently become activator as well. Later changed to HF, mainly on 10 and 14 mhz, CW & SSB. We managed to make a pair of S2S QSOs with Alberto EA2DYS at Udalaitz, and Antonio EC2AG at Lemoatxa. While Marcial was operating on 10Mhz CW, I had to run after a red plastic bag (used to isolate my... well, a plastic bag) down just to finish slipping some 10 m. Not over the bag but after it, so my aim was not accomplished. I was really wet on that side. Anyway, after a bit less than 2 hours and about 100 QSOs, the cold was more than we could resist. We packed everything and made the short path back to the car. Unbe Mendi was officially inaugurated! Thanks to all chasers around the Basque Country and EU who have contacted us, and the rest, don't worry, we'll be back soon!